The suspension system of a vehicle is connected to the steering system. Together they work to provide a safe and comfortable ride, and to keep the vehicle in the driver’s control. In a perfect world, all roads would be perfectly smooth and all cars would have smooth rides. However, in the real world, potholes, pebbles, and unpaved roads can make for a bumpy ride. That’s where a suspension system comes in! 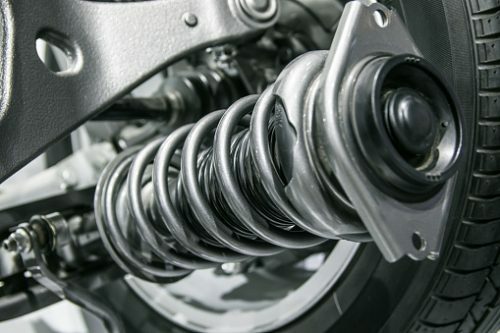 The suspension system of most vehicles is made of springs, shocks, and struts. When the vehicle drives over a bump, the springs compress. After the bump, the springs expand. This allows the wheel to go over the bump while keeping the vehicle level. The same works for potholes. However, in order to keep the springs from continually bouncing until the energy from the bump or pothole is gone, another part takes over. The struts and shock absorbers take the energy from the springs, and allow the vehicle to remain stable. This helps the vehicle keep the tires on the road, which is necessary for accurate steering, braking, and general control of the vehicle. The most obvious sign that a suspension system needs to be checked out is a noticeably bouncy or rough ride. If you’re suspicious, try pushing down on the hood of your car. If it bounces more than once or twice, it’s time to get your shocks and struts checked. Everyday driving can also wear on the suspension system, and hitting bumps or potholes, or driving on unpaved roads at high speeds can damage a suspension system faster. Whether you’ve been in an accident or not, there are some signs of damage to a suspension system. • The wear on your tires is uneven or excessive in a short period of time. • Your shocks or struts are leaking fluid. • During a turn, your vehicle sways to the side. • Bumps cause your vehicle to bounce excessively. • When you hit the brakes, the front of your vehicle dips down. Especially when the front of a vehicle is damaged during an accident, there is risk of damage to a suspension system. A suspension system is critical to maintaining the safety of your vehicle, and keeping it on the road. If you notice any of the signs listed above, consider speaking with your local collision repair expert.